just up the pike: what does discovery leaving mean for silver spring? what does discovery leaving mean for silver spring? Tuesday's announcement that Discovery Communications plans to close and sell its headquarters is a huge blow to Silver Spring, whose revitalization Discovery helped kickstart 20 years ago. Discovery in 2010. Photo by the author. 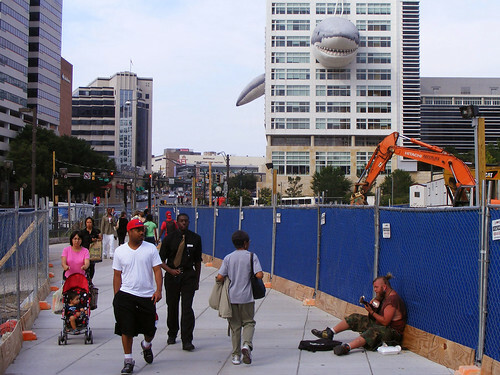 Discovery, which operates TV channels such as TLC, Animal Planet, and OWN, currently employs about 1,300 people at its headquarters, which occupies a giant city block across the street from the Silver Spring Metro station and is known for its iconic Shark Week-themed displays. It’ll move their global headquarters to New York, while their US headquarters will go to Knoxville, Tennessee, home to Scripps Networks, which Discovery agreed to purchase last year.